Were you hoping to land an iPhone 4G at yesterday’s presale events? 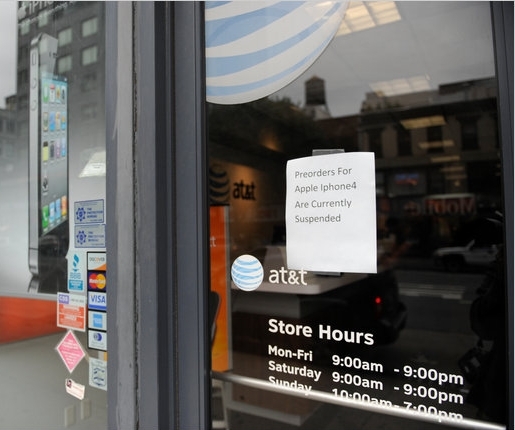 Well, if you didn’t get one then thanks to the many website glitches and ordering difficulties, you’re going to have to either stand in line on launch day like everyone else, because AT&T has sold out of iPhone 4G preorders. That’s right, yesterday AT&T had its biggest sales day in company history, all thanks to Apple. AT&T and Apple sold 600,000 iPhones in a single day, and that’s even after all the problems the company suffered to to staggering demand. “It was the largest number of preorders Apple has ever taken in a single day and was far higher than we anticipated, resulting in many order and approval system malfunctions,” Apple said in a gloating statement. The demand is so great that if you preorder a phone now, it won’t arrive until July 14, well after the phone’s legitimate launch date. No wonder other mobile phone companies are trying to steal Apple’s thunder with free phones!